On Sugar and Slavery – Dana's Low Carb for Life! Steeped as we are in Civil War history, not to mention Hollywood images of the Old South, when Americans think of slavery we tend to think of cotton plantations. But the majority of people stolen from Africa and enslaved were not brought to North America, but to the Caribbean and Brazil. And they did not work on cotton plantations, they worked on sugar plantations. As demand for sugar exploded in the 16th century, the Caribbean islands and Brazil became the main sources. Cutting sugar cane is brutal, back-breaking labor. Free people simply would not take the job. To feed the system, people were stolen from their homes in Africa and pressed into slave labor in the sugar cane fields. I have read that slaves working in the cane fields generally lasted about 7-9 years. Even in a chattel slavery system, where the children of slaves were also slaves, this created a labor shortage. More and more people endured the horrors of the Middle Passage only to be worked to death to supply the world’s craving for sugar. 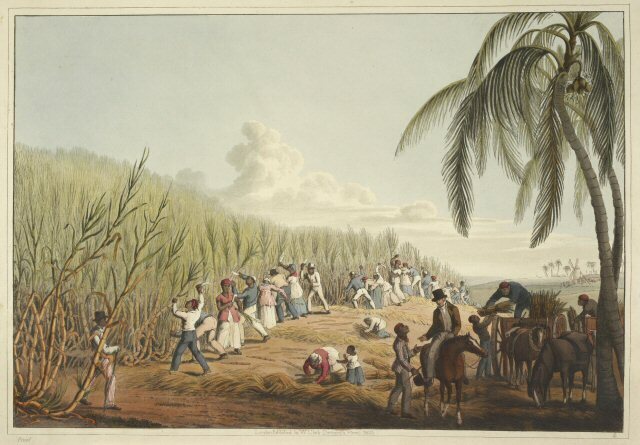 In short, sugar was not just a driver of slavery, it was the main driver of slavery. Sugar is a highly addictive drug*. Where there is addiction, there is profit — another major driver of the demand for slaves was the tobacco industry. Where the profit becomes great enough there will be people willing to do evil things to get a share of it. The human tragedy of slaves bound to the sugar industry was that era’s version of the horrors wrought by modern drug cartels. * Sugars do, of course, appear in fruits and vegetables. This validates the idea that sugar is a food. I contend that it is the concentration that makes the drug. Natives of the Andes have chewed coca leaves and drunk coca tea for centuries with no sign of the crazed addiction that concentrated cocaine induces. Similarly, sugar in fruit — especially wild fruit, not, like our cultivated fruit, bred for extra sweetness — did not cause problems for earlier generations. The old maxim “The dose makes the poison” holds true, too, for drugs. It is the concentration of sugar which allows for dosages that trigger addiction.